Will you wear white to a wedding? I guess, you won’t, especially when you are bridesmaids. It’s a long-standing rule that female guests should never wear white to a wedding. Yet a couple of recent high-profile weddings have seen a crop of chic young things sporting the forbidden shade as maids of honor: In celebration of Poppy Delevingne’s nuptials to James Cook today—the bride wore a custom creation by Karl Lagerfeld for Chanel—we pinpoint how her sister, Cara, also in Chanel Couture, and Pippa Middleton, who wore a custom Alexander McQueen dress by Sarah Burton at the royal wedding, make white seem right. For Middleton, wearing white required a bevy of flower girls and a bronzed physique. Her cowl neckline offered a hint of skin while still possessing the British reserve required for the occasion. Fashion darling and streetwear aficionado Cara slipped into fluttering layers of silk for an unexpectedly graceful, ethereal moment (without upstaging her older sis). 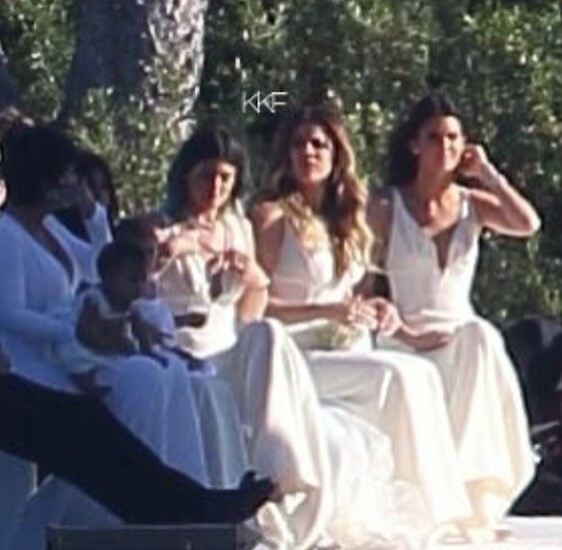 And also, in pixelly creepshot number one, we see Khloe and Kendall in the white Mermaid-style number. The dress features a scoop neck with a slash at the center front, allowing for varying amounts of cleavage on each Bridesmaid. It’s like a one-size fits-all neckline! This further’s our theory that wearing white to a wedding is totally acceptable even if you’re not the one saying the vows. I mean, Kim had her rehearsal dinner at Versailles. Babygirl is not about compromises. Besides, it’s not the first time her bridal party has worn white. Remember the white bridesmaid dresses from her wedding to Kris Humphries? Here they are, below, as seen on Kendall and Kylie. So now will you choose white to attend a wedding? Shop white bridesmaid dresses online. This entry was posted in bridesmaid dresses, celebrity, Weddings. Bookmark the permalink.